Rev. 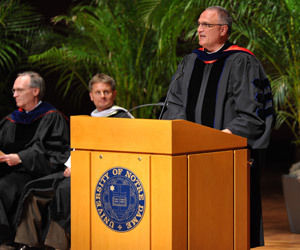 Ronald Nuzzi, senior director of the Mary Ann Remick Leadership Program in the University of Notre Dame’s Alliance for Catholic Education (ACE), has received the C. Albert Koob, OPraem, Merit Award, with which the National Catholic Educational Association (NCEA) honors an individual who has made extraordinary contributions to Catholic education in the United States. The NCEA presented the 2013 Koob Award to Father Nuzzi during the group’s annual convention, attended by 8,000 Catholic educators April 2-4 in Houston. Father Nuzzi made reference to his work in ACE, where he has served since 2002 as the founding director of the formation initiative preparing the next generation of principals and other leaders for Catholic schools. The Remick Leadership Program has become the largest program of its kind in the country. Later this year, Father Nuzzi will lead a new ACE initiative assisting Catholic schools as they assess and renew their Catholic identity in the spirit of the New Evangelization. ACE will seek a new director for the Remick Leadership Program, for which Father Nuzzi will continue as a faculty member. As Father Nuzzi commented in a video posted April 2 by the NCEA, his perspectives on Catholic education have been shaped by his own service in parish and diocesan schools and at Notre Dame, as well as scholarly work at Saint Louis University and the University of Dayton. Father Nuzzi, a priest of the Diocese of Youngstown, Ohio, has a distinguished academic background. He has authored or edited a number of books, including two published in recent months: “Striving for Balance, Steadfast in Faith: The Notre Dame Study of U.S. Catholic Elementary School Principals” and “Building Assets: The Strategic Use of Closed Catholic Schools.” Both were co-authored by ACE faculty members Jim Frabutt and Anthony Holter. The same team produced “No Greater Work: Meditations on Church Documents for Educators” in 2010 and “Faith, Finances, and the Future: The Notre Dame Study of U.S. Pastors” in 2008. Originally published by William Schmitt at news.nd.edu on April 16, 2013.